Winter is here people! We’ve gotten to that time of year where you can’t just chuck on a hoodie, bomber jackets need to be put away, and you can forget about that Primark vest top. It’s coat season; and as always, the return of the fur coat. If you’re going full on fur or just a hooded trim, at Iya – Louisa’s we’ve got you. However, keeping with true Iya – Louisa’s style and fashion, these coats are all cruelty free. Why wear faux fur (fake fur) this winter? an almost identical look to real fur but it’s completely cruelty free. Real fur comes from well, yes, animals. Unsurprisingly a lot of our fur is from China, but more surprisingly our fur from china normally comes from over 2 million cats and hundreds of thousands of dogs which are bludgeoned, hanged, bled to death and often skinned alive for their fur. There are no penalties for people who abuse animals on fur farms in China, which is the worlds largest fur exporter. Still angry about the Traditional Chinese dog festival yet looking for a new fur coat? If you’re not wearing cat or dog fur you’re probably wearing rabbit considering over a billion rabbits are killed each year for this very reason. So now you know where your fur is coming from how do they get it? Eighty-five percent of the fur industry‘s skins come from animals who were captive on fur factory farms, where they are crammed into severely crowded, filthy wire cages and later often skinned alive. If it’s not a fur factory farm it will be animals caught by traps, normally steel-jaw traps. These traps slam shut on an animal’s limb, which causes excruciating pain and leaves the animal stuck and starving, sometimes for days. The conibear trap crushes an animal’s neck by applying 90 pounds of pressure per square inch, leaving the animal to suffer for another three to eight minutes while they slowly suffocate. Another method is electrocuting fur-bearing animals anally and genitally slaughter to limit damage to the animals’ fur. After an animal has been slaughtered, their skin is treated with toxic chemicals to keep it from rotting and decomposing in the buyer’s closet. Thus, that’s why you should wear faux fur. 9.) We have Topshop’s Casual Leapord Faux Fur Coat at £89 because if you’re going to go fur you may as well go all out. 6.) Fancy splashing out? Then it has to be on the Tan Suede Mongolian Faux Fur Coat for £250 from Miss Selfridge. You can just see this being worn by the lead in almost every Christmas romcom. 3.) Number 3 is Boohoo.com with the Boutique Jasmine Vintage Faux Fur Coat. We just love it, and at £40 you just cant go wrong. 2.) If you want to go all fur we have the coat for you. New Looks Blue Vanilla White Leopard Print Faux Fur Coat at £75. 1.) Finally we have River Islands Grey Faux Fur Collar Padded coat for £90. Perfect for every occasion with the detachable fur collar this is definitely our favourite. So there you have it, 10 beautiful Faux Fur Coats perfect for this winter. 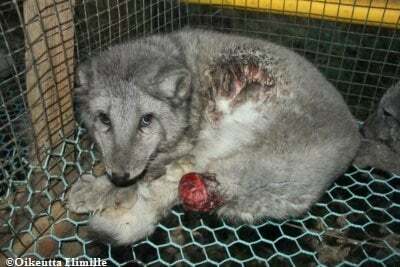 Say no to Fur. Next Post Do Vegetarians Even Celebrate Christmas?